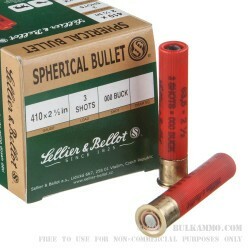 Sellier & Bellot, delivers a formidable self-defense shotshell with this 410 bore 2-1/2 inch 3-pellet buckshot cartridge. 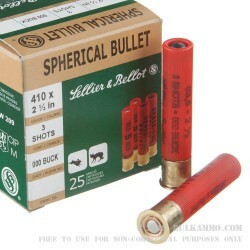 Perfect for short-range defensive situations, these shells discharge 3 lead 000 buckshot pellets at 1256 fps. 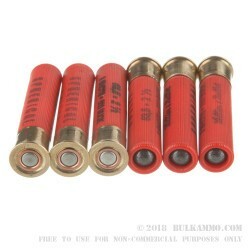 These shotshells will work admirably in a 410 bore shotgun, however they reach their true potential when used with a Taurus Judge. As part of the CBC Group, Sellier & Bellot is the oldest operating ammunition company in the world, and is devoted to manufacturing high quality ammunition that is capable of meeting standards and specifications set forth by the U.S. Military, NATO, SAAMI and CIP. So when it comes to loading your Taurus Judge, choose the 410 bore buckshot shotshells made by the ammunition supplier that has been trusted since 1825: Sellier & Bellot. Q: Can this ammo be used in a Taurus Judge? 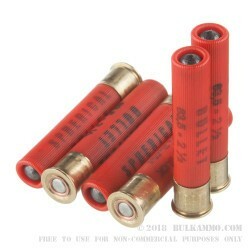 A: Hello, Yes, these 2 1/2" 00buck shells in 410ga. by S&B can be fired in a Taurus Judge. They make great target and defense rounds in 410ga.